In a forceful MLK Day speech, Al Gore connects the dots: the wiretapping and harassment of King was one of the factors that lead Congress to enact the Foreign Intelligence and Surveillance Act (FISA), the very law George Bush violated when he authorized wiretapping of citizens who've committed no crime. He says, "At present, we still have much to learn about the NSA's domestic surveillance. What we do know about this pervasive wiretapping virtually compels the conclusion that the President of the United States has been breaking the law repeatedly and persistently." And that's just the beginning. Gore went on to blast Bush for an unprecedented expansion of presidential power: now a president can imprison Americans for life without charge or warrant, he can intercept email and phone calls, he can torture suspects and fly them to countries where torture is legal, he can launch war on false pretenses and suffer no one's wrath. "If the President has the inherent authority to eavesdrop, imprison citizens on his own declaration, kidnap and torture, then what can't he do?," Gore asks. ...by consistently resorting to the language and politics of fear in order to short-circuit the debate and drive its agenda forward without regard to the evidence or the public interest. As President Eisenhower said, "Any who act as if freedom's defenses are to be found in suppression and suspicion and fear confess a doctrine that is alien to America." While Gore's speech feels like he's campaigning (two words for you: Gore-Feingold), such political labeling ignores the fact that he's saying what needs to be said. Please, oh please, watch or read his important speech. [W]e are all capable of believing things which we know to be untrue, and then, when we are finally proved wrong, impudently twisting the facts so as to show that we were right. Intellectually, it is possible to carry on this process for an indefinite time: the only check on it is that sooner or later a false belief bumps up against solid reality, usually on a battlefield. 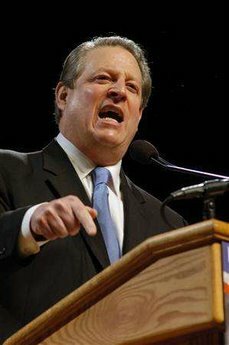 And: Gore quoting Lincoln:"We must disenthrall ourselves, and then we shall save our country."